His instruments distinguish themselves for many reasons: quality of materials utilised, precision and personality of the workmanship, varnish quality and color, and fine acoustics. 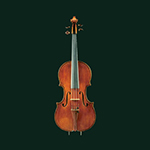 Basing his work upon the classical line of violin-making, he builds his instruments applying his personality and taste in every small detail: the f-holes, the varnish, the cutting of the scroll. 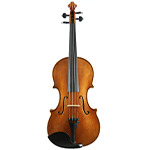 For many years he has been dedicated to the reproduction of classical Italian instruments. 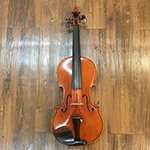 He has made copies of instruments by Andrea Amati, Nicola Amati, Andrea Guarneri, Francesco Ruggeri, Guarneri del Ges?, Antonio Stradivari, all of which have been particularly appreciated in the U.S.A., Germany and Japan. 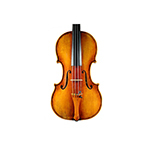 Baroque-specialised musicians have shown great interest in his period instruments: viola d'amore, viola da gamba, pochette, lira da braccio, baroque violin, baroque viola, baroque cello. 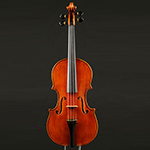 His main interest, however, which began to emerge during the first formative years of his career, is the reproduction of Stradivarian inlaid instruments, which he believes to be the quintessence of artistic and technical perfection. 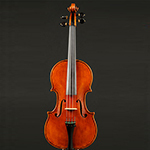 From 1983, the year in which he built his first inlaid violin, preserved in the museum of the International School of Violin-making in Cremona, and until the present day, he has made copies of the Hellier, Ole Bull, Sunrise, Cipriani Potter, Rode, Greffhule violins and of the Spanish and Axelrod violas. His own personal violin is an accurate copy of the 1709 Greffhule inlaid Stradivari which he regularly plays in duo with his brother Vittorio or with various Cremonese musical ensembles. 1989 (Baveno - Italy) violin: award for the best sound. 1995 (Baveno ?- Italy) cello: bronze medal. 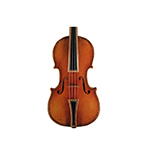 1995 (Bagnacavallo - Italy) violin: bronze medal. 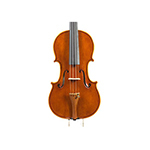 1995 (Poznan - Poland) violin: award for the best style and character of the work. 2003 (Modena - Italy): diploma and medal of excellence for the instruments made. Founder member and current chairman of the "Liuteria Parmense". Founder member of "Liutai Milanesi Contemporanei" . Member of the V.S.A. 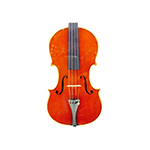 (Violin Society of America). 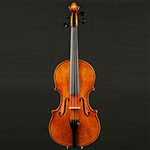 1997/1998 – restoration andof stringed instruments at the “Scuola di artigianato Artisti?co del Centopievese". 1998/2001 – stringed instrument varnishing at the "Scuola Internazionale di Liuteria” in Parma. 1998/to date - stringed instrument painting at the "Civica Scuola di Liuteria" in Milan. Top is Italian Sprece From Valdi Fiemme, Valley in North of Italy. One Piece back from Bosnian Maple very fine ,Slap cut with very strong deep large flamm.